I had no idea about the Denys Fisher Cyborg line! I knew about Henshin Cyborg, but not this! And I always wondered how Mattel got around using Sea Devils as a name for their scuba-centric toyline, since DC had characters with a similar theme years before! Last edited by Earth 2 Chris; Sep 14, '18 at 2:00 PM. I doubt DC had the forsight to register the name for toys. That wouldn't happen now. Thanks for putting this together. Its a fun read. So Cyborg is sort of like 9 inch Micronauts then? Or am I oversimplifying? Looks pretty cool. Love the mask and the Sea Devils set...especially the Sea Devils. Thanks for sharing these. I’m ashamed to say that I have not purchased and read your Rack Toys book. I’ll check out the auction. Heh, I'm the same way. Several years back I started to put together a collection of these but bailed about half way through and sold them all. 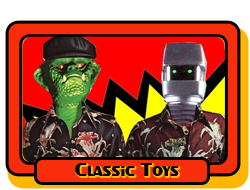 A great toy line but I just have enough on my plate as it is. That's basically it. Denys Fisher took the 9" Shonen Cyborg (loosely translated as "Kid Cyborg", think Action Boy in the Captain Action line) figures from Takara's 12" Henshin Cyborg line, and shrunk down some of the 12" Henshin figures and costumes to 9" scale. Last edited by cjefferys; Sep 14, '18 at 8:32 PM.